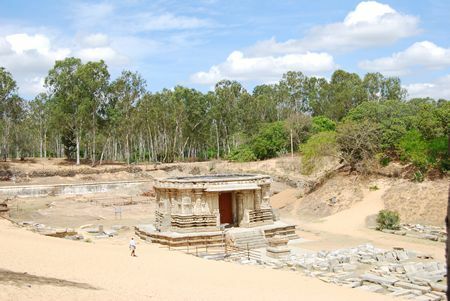 TOOK A TRIP TODAY to Talakaddu, in Karnataka, a place where apparently 35 temples and a palace are under the sands of the Kauveri river. The archaeological department is working as hard as it can to rescue the remains from this ancient site, but there’s so much to do and little money to spend on it. Nevertheless, the reconstruction of a Vishnu temple is well under way, and to illumine the inside of the part the department has restored, it’s using solar panels to power the lights. 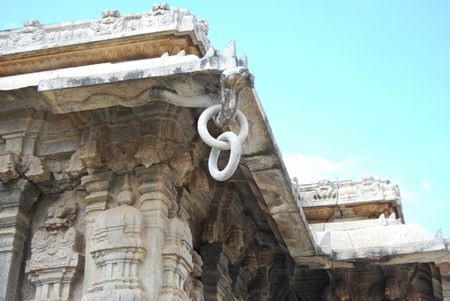 Meanwhile, on another part of the site, here’s a shot of the side of a temple illustrating a pair of rings carved from the same stone.